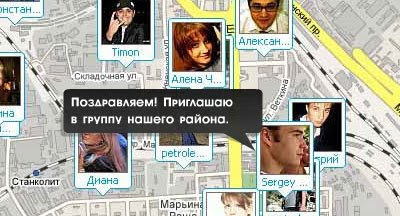 Aroundme is a very nicely designed Google Maps based social sharing site for Moscow. Registered users are able to show the location of their favourite places in Moscow and find points of interest added by other users. Mirtesen is a social networking site that uses Google Maps to show the location of members. As well as allowing members to make new friends and connections the site also encourages the social sharing of points of interest. This Google Map mashup is designed so that neighbours can connect online. It is a forum for people to help each other learn more about their city and the region. The site allows users to not only connect with other users but to rate and review local locations and learn more about their neighbourhood. Rusvatobus have partnered with Moscow's transport authority to provide an English guide to the city's public transport system on Google Maps. Using the map it is possible to enter your starting and finishing destination. The map then displays the best route you can take using public transport. The route is displayed on the map and listed in detail under the map. Thanks Abava - link added to the post.